If you work as a graphic designer, a pen tablet – also known as a graphics tablet – is an indispensable tool to have at your disposal. With it, you can draw directly onto your tablet and have the images you create appear on your computer screen, no scanning required. As is the case with any electronic item, there are many brands and models of pen tablets available. It can be a challenge to sort through them and pick out the best one for your needs, and that’s why we’ve done the legwork for you. Let’s start by talking about some of the features you may want to consider before making a purchase. There are only a few real competitors in the market for pen tablets, but that doesn’t mean that you don’t have choices. Here are the main components to review. Pressure Sensitivity: The first and most important element to consider is the pressure sensitivity of the tablet in question. When you draw with a pen or pencil, you’re limited to three or four points of sensitivity. Not so with a pen tablet. In fact, the tablets available can provide anywhere between 512 and 2048 points of sensitivity. The more sensitivity a tablet has, the better you will be able to control the intensity and flow of your strokes. What you’re looking for is a tablet that gives you the maximum amount of control. 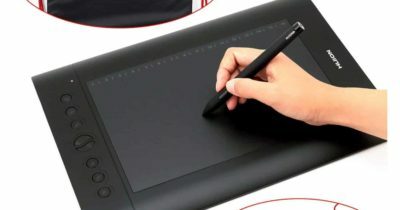 Hot Keys: Some pen tablets offer designers a series of hotkeys that they can program to eliminate the need to use keyboard shortcuts. This option can save a lot of time, particularly if you use the same shortcuts frequently. After all, the goal is to make your designs better and make your job easier to do. Size: The size of the tablet matters too. You might prefer a small tablet that you can easily take with you on the go, or if you’re using it for CAD, a large tablet might be the best option for you. Tablets come in a wide range of sizes so there is an option for everybody. Price: It would be great if we never had to worry about the price, but for most of us, it’s a consideration. Some tablets are more affordable than others. You’ll have to think about what you need and what you can afford to spend and then set an appropriate budget for your new tablet. 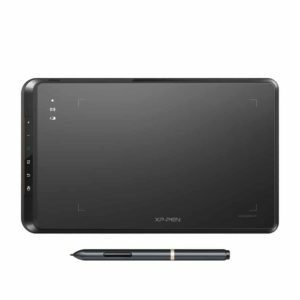 Now that you know what some of the key options to consider are, it’s time for us to reveal our picks for the top 10 pen tablets for designers. The Parblo A610 is an affordable choice for those who are just stepping into the graphic designing world. Its main features are its large drawing surface, 8, and three style pens. Traveling with a laptop can we difficult at times and always has battery issues since it needs to be plugged in for power. The Parblo 4610 is charged solely through a USB port. All it needs is one cable and a battery pack to be charged anywhere anytime. So that is a plus apart from that the tablet comes with an anti-fouling glove. You do not need any extra cleaning equipment to keep off stains or any kind of dirt from the environment. The tablet does not weight that much, which means you can take it anywhere easily without having to worry about getting tired of carrying it. It can fit in your laptop bag or your handbag. Overall, if you judge the tablet by its pressure sensitivity, high-quality stylus, eight hotkeys, and the cleaning products for the tablet makes it worth the price it has been set for. There are a few cons to the product. For one, the website does say that the tablet supports windows ten but upon installation, it works fine for a while and then slowly within a few uses it loses its function, which is a clear indication of software issue. Another issue faced by many customers is that the user manual is in unstructured English, which is why many users are unable to understand it or even get help from customer support. These two issues are the biggest problems faced by Parblo A610 users. It is similar to the Parblo A610 but has a plus side it supports Windows XP and OS X. It has similar features to the Parblo tablet, but a major difference is that it does not have a USB charging port instead it uses AAA batteries, which is not so bad because it has longer battery life. It has eight express keys that are nicely spaced from one another. It does not lead to any accidental clicks that interrupt your current work. Since it is an entirely different company product, it does have its flaws. For example, it is easily scratched once it is drawn on, but a simple screen protector can solve that. Other than that, the stylus was made with a rubberized grip that is perfect for long-term work. The artist can easily draw holding the stylus for long periods without getting tired. The pen is a bit longer, so for those of you who prefer longer pens then this tablet is the perfect fit for you. It is also lightweight, and the stylus is the best feature of this tablet. They are now coming to the structure of the tablet. It is slim and lightweight, which makes it portable and perfect for traveling and doing work mobile. All graphics tablets are in the end compared to Wacom’s Intuos pro. 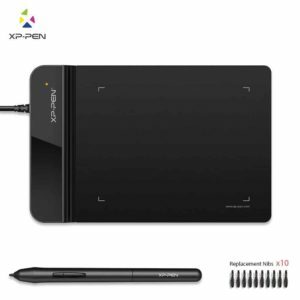 Well, XP pen star05 wireless is also another cheap alternative for graphic designers who are either beginners or who are looking for affordable alternatives that can still get the work done. The design is sleek and professional. The drawing space is wide enough and utilizes the tablet till its corners. The best part of this tablet is that instead of having express keys it has shortcut keys that can be customized for user preference. Now, you can do anything like make an undo button or zoom in button, etc. Apart from that, the instruction manual is pretty simple and reader-friendly. It has illustrations to further help users install the product to its full capacity. Now, coming to the design and structure. The drawing screen is bigger than the Intuos screen. It has more drawing space even though it is smaller. Another pro is that it has an energy saving mode, which helps save battery life during critical times when you do not have your charger at hand. The pen pressure is the same as the Intuos. The tablet is too good to be true but then why it is ranked comparatively low, well the answer is simple. It has initial installation issues, and if you get through them and find a solution, then it is perfect. The touch keys are placed too close to the side, which is why when any user handles the tablet the keys are activated accidentally, which disrupts the work. The pen is lightweight, so for those who prefer it that is a plus, and for those who work with weighted pens well you will get used to it and see how it positively affects your drawing. The basic design of this tablet is a square shape with rounded edges and like many others; it comes with shortcut keys and a pen. It has a USB charging port the same as the others. It is one of the cheapest tablets in the market. What is unique about this design is that it has a border with white symbols all around the edges. The touch keys replace the express keys that are present on most drawing tablets. These touch keys are pre-designed buttons for undo, save, exit, etc. All these options are squished together in one place, so users have trouble using it. It has a seemingly continuous issue that all our tablets have so far in our list, which is poor installing instructions. The directions are very technical, so hard to understand by non-technical people. An area of huge concern is the low durability time of this tablet. The tablet is said to die out after a few months of use, which is no good for many people. It is cheap for what it’s worth, but nobody likes to waste money. The tablet is good for a basic start and helps you get through the initial learning period. Here is the new predecessor of the Huion 1060 plus. As the name suggests, it is the new model of the tablet, which means it has new features and a couple of reasons why you should get it. It is a customizable tablet that anyone can get on competitive prices. It comes with two extra things: an artist glove and a cover. In comparison to the previous model, this one is slimmer and has more drawing space than before. The keys are lighter and more responsive, this helps to edit faster. One of the drawbacks was the micro USB cable; it is easily breakable and has less security. The stylus is the same one as before but more sensitive. You can feel the difference in the drawing. The stylus has to be charged, and if you charge it well, it can go on for a week without having to be charged again. XP pen G430S is one of the most popular graphics drawing tablets in the market right now. It has unique features that are unmatched by any other. The prices are comparatively competitive, but the tablet is worth the money it demands. It has a battery-free pen, and the tablet itself is almost battery free. It does not require any plugin source. You can simply attach it with your laptop with a USB, and you are ready to go. The tablet does not require any initial driver installations like the rest of the tablets, so it is hassle-free and ready to use when it arrives, but if you do decide to install the pen’s drivers then you can customize many features. The stylus, on the other hand, comes with two programmable buttons and is battery-free; you do not have to charge it to draw with it. It is fragile and thin, which honestly makes me believe that it would not survive an accidental slip. The tablet is small for drawing, which is a big concern for many. The Turcom TS6610 is a bit different from the rest of the tablets. It has no screen; it attaches to the laptop and is used. It has a unique feature for left-handed artists. If they use the tablet and customize it, the button will appear on the right side, and they can draw on the left. The tablet is similar to the one we discussed before. It has eight hotkeys, which can also be customized according to preference. The pen requires AAA batteries and has extra nibs. It is made of plastic and has a good grip. The pressure curve works great when it comes to drawing. The nibs might wear out eventually, and that is why they have provided extras. Drawing on the tablet is smooth, and the pressure from the pen is perfect. Palm rejection and hover is applied smoothly and work fine. I would definitely suggest it for left-handed artists. 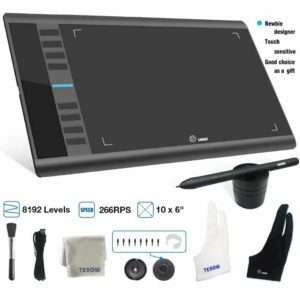 Time to review the best of the best drawing tablets in the market. Wacom is a leading company when it comes to drawing pen tablets. In this edition, the company added a rough texture to the tablet that would resemble the roughness of drawing paper to give it a more artistic edge. The tablet has a switch on the side to turn the touch feature on and off according to preference. It also has Bluetooth, so goodbye wireless connection. The unique feature is the paper edition in which you can draw on a piece of paper and then transfer it on to your computer. This helps you stick to traditional ways and digitalizes your work at the same time. Apart from that, the penholder is also the nib remover. The only downside to this tablet is that the pen nibs wear out fast and there is no small size model. This tablet is for professional use and gets the work done. 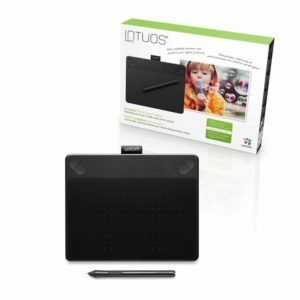 Intuos pro has become a name in the market and is associated with one of the best works. Every professional graphics designer has one. Even though Wacom is at the top of the digital artboard, Huion managed to get the top 2nd position with its H610 pro. It is a little smaller than the Intuos 5 but matches up to it at every level. It is cheaper than Intuos 5 which is three times more expensive. Apart from that, it has a button on the side instead of a scroll and has a glossy finish. Lastly, the pen is slimmer and durable. It has the same pressure as the Wacom pen, 2048. It has two shortcut buttons, and the nib is great. Although personally, I would prefer more nib styles because every artist has different references. The pen only works when it is charged, which is not very practical or preferred. The driver software works better on windows as compared to Mac, but there is no argument that this is better when it comes to price comparison. Huion has managed to win when it comes to affordability. Well you know what they say, Old is gold. When it comes to Wacom’s Intuos photo and pen, nothing can beat it, which is why it is still our number one choice. It is a flawless product with the best features. It is small, lightweight and slim yet it feels solid. The tablet has multi-touch gestures. Also, it comes with extra nibs. Drawing on a Wacom tablet just feels different and smoother. It has an unmatchable design and structure. 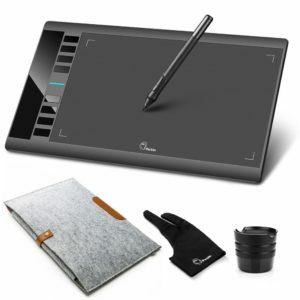 It is a bit old now, and since it is a Wacom pen tablet it remains expensive, but if you plan to spend wisely and generously for a good product, then this one is the very best. 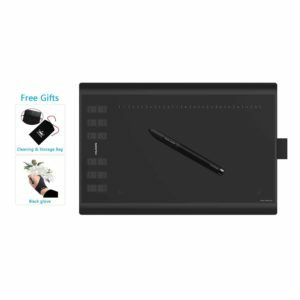 Whether you’re a professional graphic designer or an aspiring artist, having the right pen tablet can help you express yourself through your work. The 10 tablets on this list have some amazing features, and they are our favorites for 2018. Wacom Bamboo pen tablet is more of a professional model. It has a resolution of 2540 and comes with a lot of free software. It includes a pen and offers an active area that is twice the size of regular tablets. The model also comes with four express keys that can be configured as shortcuts. Its only downsize is the price of the pen tablet as it is one of the more expensive models. The VT PenPad is an excellent option for the ones that never owned a pen tablet before. It is inexpensive and quite reliable. The model is fairly small but offers a decent work surface area and comes with a learning tool that can help develop and enhance graphic design skills. The model includes a pen and the tablet itself and comes with a resolution of 2048. 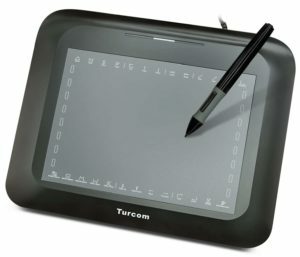 Turocom TS-6580B is one of the most affordable pen tablets making it a decent option for the ones that have an extremely limited budget. It has a resolution of 4000 LPI and a report speed of 200. 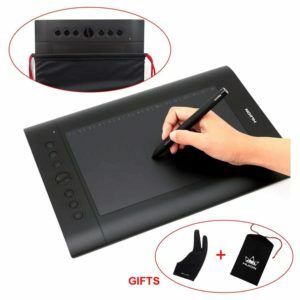 The package includes 4 spare tips, the pen and the tablet. In terms of working area the model offers a surface of 8 by 5 inches that simulates the natural feel of working with a pen on paper. VT Realm is a mid-range pen tablet that offers a generous working surface and excellent response rates. It has a high resolution working area and comes with several tools that makes it much more convenient to use. The VT actually includes handwriting recognition software and gesture flicks. It also comes with side buttons that can be fully customized. Ugee is more of a productivity tool that can be used by graphic designers as well. Despite its large size the model offers a working surface of only 10 by 6 inches which is fairly decent. It has a 2048 level pressure sensitive pen that comes with a mouse and eraser function. The model is compatible with a wide selection of software and comes with fully customizable buttons that make it much easier to work with. The Huion is a small pen tablet that was designed with portability in mind. It has a working surface of just 4 by 2 inches and comes with a resolution of 4000 LPI and a report rate of 200 RPS. The model is compatible with both PC and Mac and comes with a digital pen. The model is actually extremely basic but if is ultra-portable. 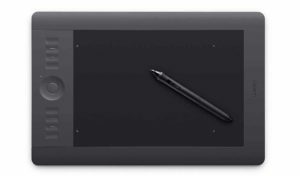 Wacom Intuos is a decent pen tablet designed to combine a practical design with a professional grade working surface. It has a high resolution and an included digital pen that is compatible with most operating systems. The model supports multiple gestures and can be used as a productivity tool as well as a graphic design pen tablet. The Huion H610PRO is one of the most appreciated pen tablets on the market due to its high 5080 resolution and excellent report rate. It has a working area of 10 by 6.25 inches and works with most operating systems. The model comes with the tablet and the digital pen that can be recharged. 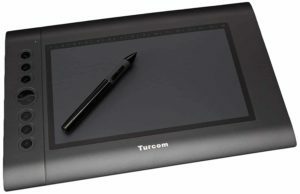 For the price the Turcom Graphic Drawing tablet is an excellent option. It is a budget pen tablet that comes with a high 4000 LPI resolution and a report rate of 200. Pen pressure sensitivity is limited to 2048 and the total active surface is 8 inches by 6 inches. The model comes with its own dedicated software and it is compatible with most operating systems. Wacom Bamboo Splash pen tablet is one of the most popular models on the market. It is a mid-range model that offers superior results with its high resolution and large working area. It has an ergonomical design with a battery free pen and an excellent response rate. The model is compatible with most operating systems and it is quite portable due to its small size.